1. Those rich green drapes have never seemed more gorgeous than when backing Frances Merrill‘s gorgeous tree. Pour a mug of hot cocoa for me, I’m on my way over! 2. Think I still have time to pull this off? I can see this delightful crimson tree next to my 3-footer. 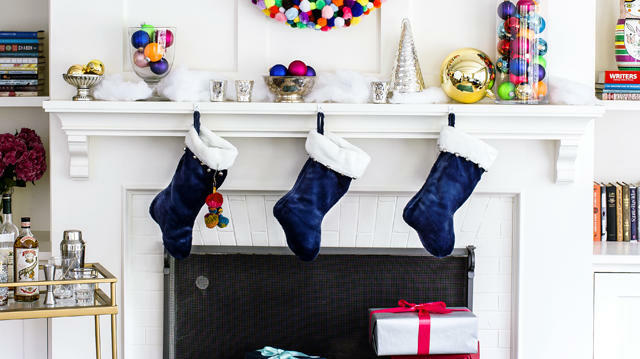 Cassandra LaValle (aka Coco + Kelley) always has must-steal seasonal decorating ideas. 3. One word: feathers! I could stare at this tree by Lindsay Pennington for hours. There’s a treasure on every bough. I'm not sure what I created or how it came together, but I like it. I think? 4. For when a wreath seems too traditional, Erica Chan Coffman has created something magical but unexpected to hang in its place. She posted a ton more ideas on her site, too. 5. Sure, it’s unconventional, but count on Kelly Wearstler to subvert a classic tree and make me like it.